The information that appears on food packaging is under more scrutiny than ever as many people carefully count their calories and regulators research companies’ health claims. However, there’s one line on nearly every item of food that bamboozles both consumers and producers alike: the “sell by” date. Or should we say the “use by” date? Whatever name it goes by on a particular package of food, misunderstanding of its meaning causes Americans to toss out more than 40 percent of their food prematurely. Although the authors of this report do not want the dates to be eliminated, they do recommend a number of changes regarding their implementation. First of all, understanding the differences between “use by” and “sell by” could eliminate a good deal of confusion right off the bat. While “use by” is printed for the consumer to judge an item’s freshness, “sell by” dates are intended solely for manufacturers and retailers for inventory purposes. The researchers also recommend national legislation to clarify the dates’ meaning, which may already be in the works after the NRDC/Harvard report made a splash with a few legislators in Washington. How could clarifying the “freshness” debate be beneficial to consumers? Why have producers not improved the “use by, sell by” labels already? 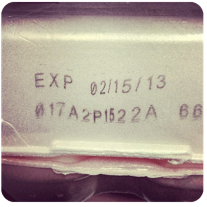 Source: Alexandra Sifferlin, “Is Your Food Expired? Don’t Be So Quick to Toss It,” Time, September 18, 2013. Photo by Mike Davis.